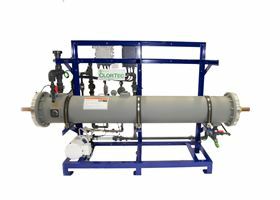 De Nora's ClorTec DN Gen II electrochlorination system will be launched at WEFTEC. Designer and maufacturer of water disinfection, filtration and electrochlorination systems, De Nora Water Technologies, has announced that the launch of the upgraded version of the ClorTec on-site sodium hypochlorite generators will take place at WEFTEC, from 29 September to 3 October. The new De Nora ClorTec DN Gen II electrochlorination system is designed to offer greater on-site sodium hypochlorite generation efficiency. Upgrades include a new design that allows the duty and standby units to be mounted on the same frame, saving up to 50% on the footprint. Other improvements include 100% access to every component, making operation and maintenance simple, and a proprietary liquid flow backboard that can be located anywhere in the building for additional flexibility. New features include a non-intrusive level switch and temperature sensor design, optional split flow technology, and water and brine flow controls. Additionally, Smart Monitoring technology and acid cleaning notifications allow users to remotely monitor, troubleshoot and control the operation of their system and provide operation and performance data remotely. De Nora will be showcasing the ClorTec DN Gen II electrochlorination systemat WEFTEC in New Orleans at booth #1729.